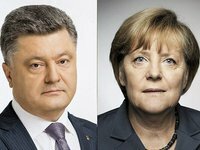 Germany's Counsellor Angela Merkel has discussed with President Petro Poroshenko of Ukraine the incident in the Kerch Strait, stressing the need for de-escalation and a dialogue between the parties involved, Steffen Seibert, spokesman for the German Federal Government, has said. "The chancellor voiced her concerns about the situation and pointed to the need for de-escalation and a dialogue, which she is going to support," Seibert said. The two politicians agreed to continue to be in close contact on this issue.